Backyard hooligans will have a field day with this laser slingshot. No more failed attempts at scaring the neighbor's cat out of a tree or messing with pedestrian's heads. Just aim the "laser sight" at your target, pull back, and this beauty does the rest. 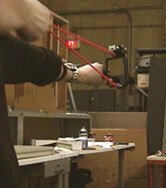 Check out the videos of the slingshot splitting apart pencils at 20 feet away. Each slingshot comes with re-useable ball bearings just to ensure you cause more damage than a poorly constructed spitball.